Introducing HotTea Mama. This is their story! We met 10 years ago in the dreaming spires of Oxford. We went for coffee, drank incredibly strong cocktails and opened bottles of wine every weekend. Every time we were unceremoniously covered in vomit or worse, paint was plastered on cream carpet or crayons scribbled on the wall, tea was our go to friend. Boiling the kettle gave us respite from the mania of toddler-hood but the resulting cuppas were often hugely disappointing. It was shortly before baby number 2 that Kate realised that someone really should be making tasty, caffeine-free teas for women like us. Especially ones that had added benefits for pregnancy and motherhood. Luckily, Bethan had been a tea taster and buyer since graduating and knew how to put together a range of delicious herbal and fruit blends that would fit the bill. 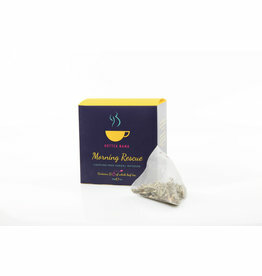 3 children later, and together we have created biodegradable whole leaf tea bags, each containing natural, tasty ingredients specially designed to support your body in the most rewarding and challenging time of your life. That said, they’re delicious and our husbands enjoy them with no shame that they’re raiding our stash. 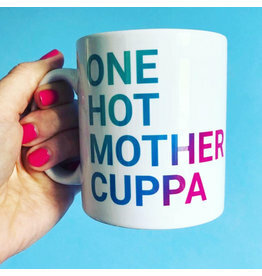 You are “One Hot Mother Cuppa”- and this mug will never let you forget it!